Jury scams have seen a resurgence in recent months. If you receive a phone call or an email from someone claiming to be a court official, DO NOT give them your social security number, credit card number, or other personal information. If you receive such a call or email, immediately contact the jury administrator by phone, toll-free, at (866) 560-4756 or by email using our online contact form. Our court will never ask for personal information over the phone or by email. 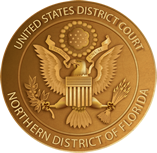 All collection of personal information is performed via paper questionnaires mailed to jurors’ physical mailing addresses, or through the Northern District of Florida eJuror web site. The federal judiciary has learned of an email scam in which emails purporting to come from federal and state courts are infecting recipients with computer viruses. According to the Security Operations Center of the Administrative Office of the U.S. Courts, the emails are instructing recipients to report to a hearing on a specified day and time. The emails also instruct recipients to review an attached document for detailed case information. When the attachments or links in the email are opened, a malicious program is launched that infects the recipient's computer. Several state courts have reported similar schemes, and also are warning the public about potential viruses. Unless you are actively involved in a case in federal court and have consented to receive court notifications electronically, you generally will not be served with court documents electronically. If you receive an email regarding a federal court case or matter of which you are unaware, you should contact the federal court in your jurisdiction before opening any attachments or links.